Veins and capillaries need nutritional support. Leg veins can lose tone after pregnancy, with weight gain, inadequate exercise or constipation. Even crossing legs can contribute. Tiny thread veins can appear on the face, legs and torso too. This unique supplement provides the antioxidants Diosmin and Rutin, which are particularly important for vein health, as well as Bilberry and Vitamin E. Best used in combination with the Aloe Vein Gel roll-on. DOES NOT CONTAIN Sugar, salt, starch, wheat, gluten, yeast, maize/corn, lactose, dairy products, artificial preservatives, colours or flavourings. Adults: Take 3 - 6 capsules a day, before bed, or on an empty stomach in the morning, with a glass of water; unless otherwise directed by a practitioner. Not advisable if taking aspirin or Warfarin. Not suitable for citrus allergy sufferers. Below are reviews of Nutrition For Healthy Veins - 90 Vegicaps by bodykind customers. If you have tried this product we'd love to hear what you think so please leave a review. 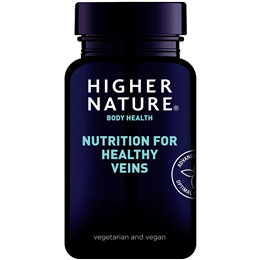 Higher Nature Nutrition for Healthy Veins - Veins and capillaries need nutritional support. This unique supplement provides the antioxidants Diosmin and Rutin, which are particularly important for vein health, as well as Bilberry and Vitamin E.